Must Love Food, I Like the Name. It’s a Social Network for Foodies. You should check it out and join. Here’s an easy link to take a peek. A Pulled Pork Sandwich and Cheese Carving at the Fair. 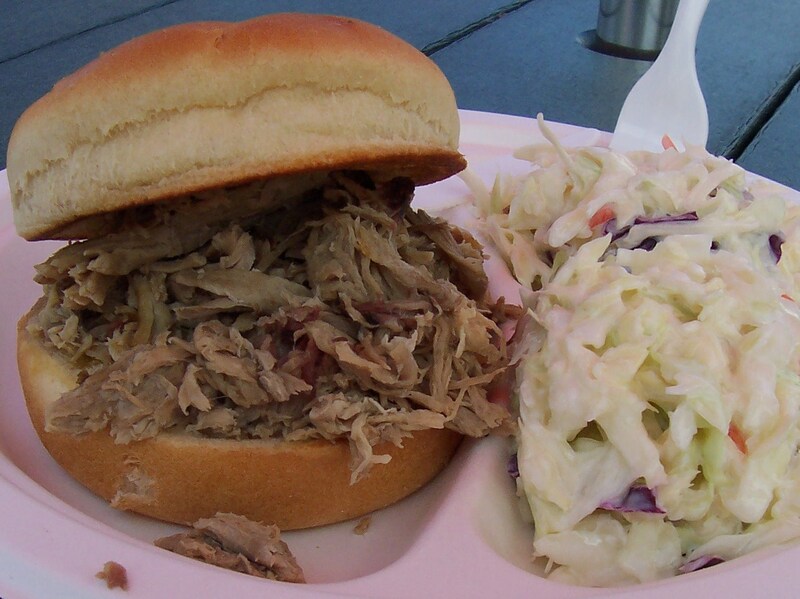 A Pulled Pork Sandwich and Cole Slaw, which may be my last meal this year at the Orange County Fair. Sadly it’s only open 4 more days, but I could possibly squeeze in one more visit. 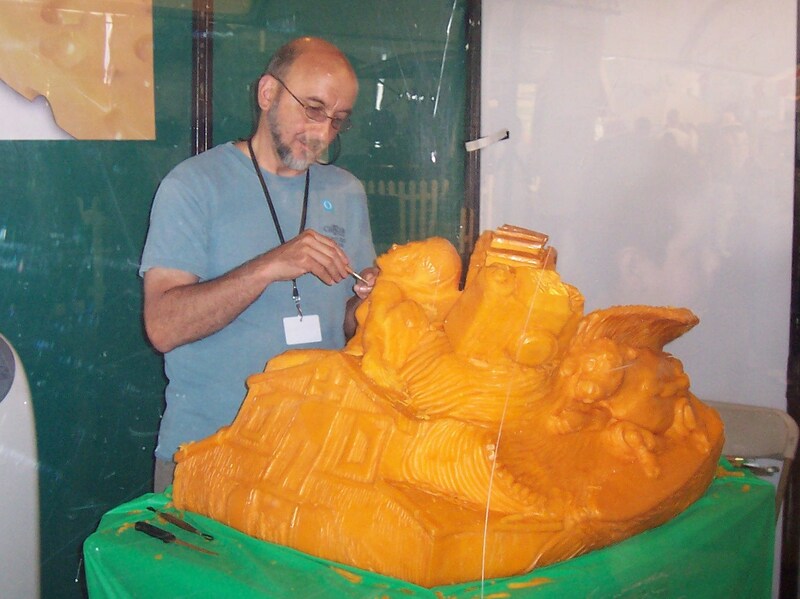 Since 2008’s theme relates to Cheese, as in “Say Cheese” and the kind you eat, they’re carving up a large block for the entertainment. It was cool to see, but it also kind of grossed me out, because it had that shiny room temperature look about it. I was going to try the Fried Spam or Fried Avocado, even though they didn’t sound good, but all had already been fried and were just sitting in the window. It wasn’t appealing. If I’m willing to try it I want it made fresh. What Makes This BLT So Special? It’s the Herbs in the Salad Mix. 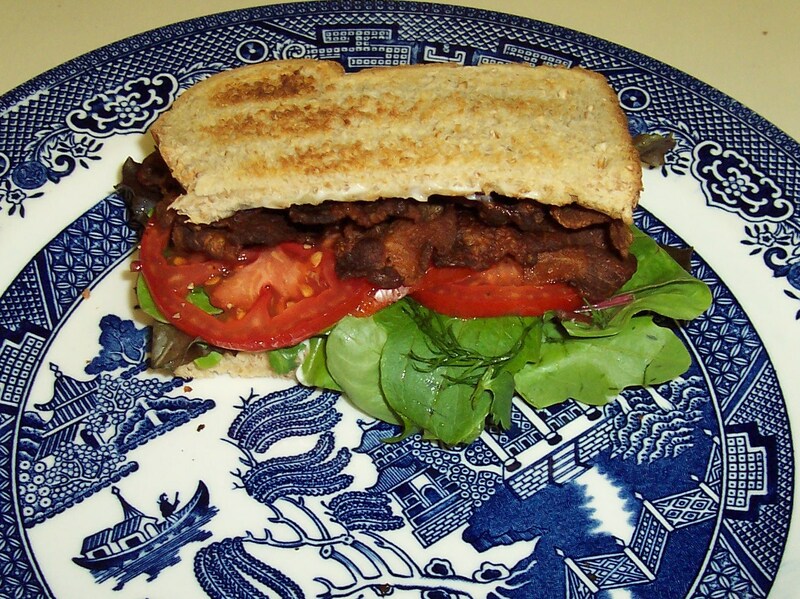 They add a sophisticated and notable dimension to the standard BLT. I now prefer it this way. I made the same Sandwich yesterday and it was so good I wanted it again. Since I didn’t have enough Bacon, I only made 1/2 a Sandwich — With a side Salad it’s a great meal. It’s easy to put together. The Tomatoes weigh down the Lettuce, and with them in the middle, the Bread doesn’t get soggy. I toast the Bread and add Mayo to both pieces, and S&P the Tomatoes too. This Herb Salad Mix includes fresh Dill, Cilantro, Parsley, Arugula, Baby Lettuce, Frisee, Radicchio, and more. TIP: I buy this mix most often. It’s great to have if you need a few Herbs. It’s less expensive overall and multi-purposeful. I’ll remove a little Dill or Cilantro to add to a recipe. Costa Mesa’s $3 Cupcake Comparison. 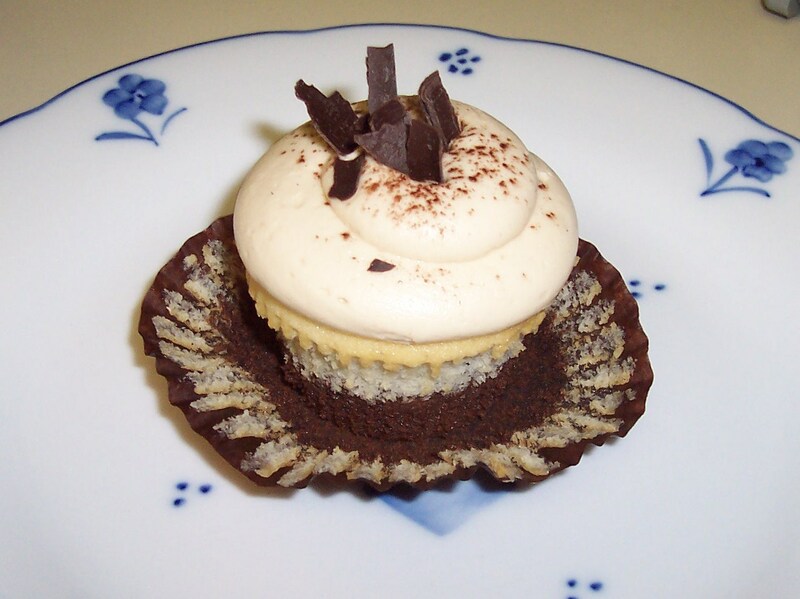 Since several Cupcake Bakeries have popped up around town, I decided to conduct a taste comparison of the 3 closest to me — Dolcissiomo, Suzie Cakes and Mrs. Beasley. I tried a small variety from each. The Grand Prize flavor winner was Dolcissiomo’s Orange Dreamsicle. It may be the best Orange flavored Cake I’ve ever had. I’m trying to confirm that opinion, but it’s only sold on Tuesdays. I’ll report about more locations as I try them. This dish happened by mistake. And the title was inspired by a funny SNL skit that cracks me up every time. Here’s an excerpt of the song by Dana Carvey with some fun animation. Choppin’ Bro CO Lay — It’s funny stuff! I was attempting to make my Aunt Barbara’s Spinach Souffle´. She’s been making it every Christmas for years. My sister and I always look forward to gobbling it down. 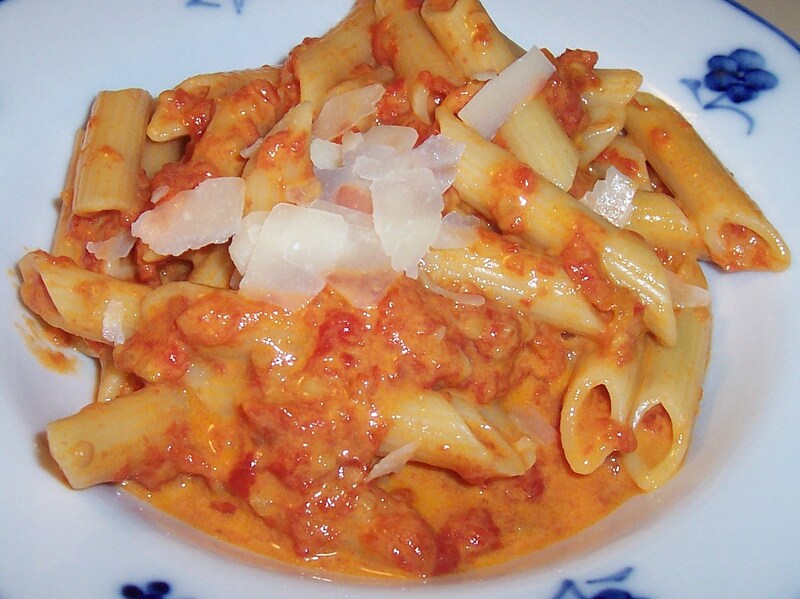 And since I recently learned how simple the recipe is, I wanted to make it immediately. But it appears I wasn’t paying enough attention at the grocery store, because I ended up with (3) blocks of frozen chopped Broccoli, instead of frozen chopped Spinach. Since I had the rest of the ingredients, I made the recipe with the Broccoli and added some Panko Breadcrumbs on top. The Broc-Co-Lay Souffle´ was okay tasting, but the recipe is a lot better with Spinach, and no Panko Breadcrumbs are needed. 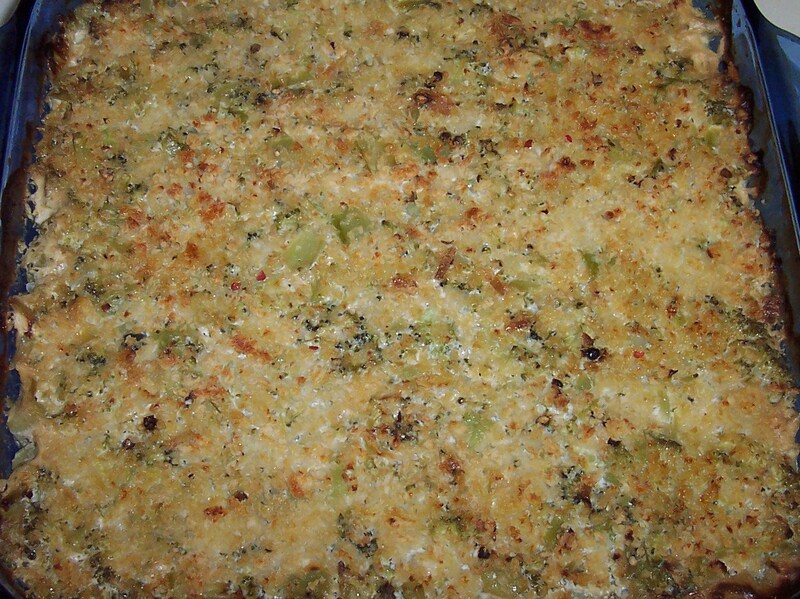 Also, it was a bit curdled looking when made with Broccoli, which isn’t attractive in a Souffle´, Gratin or similar. I won’t be making it with Broccoli again. 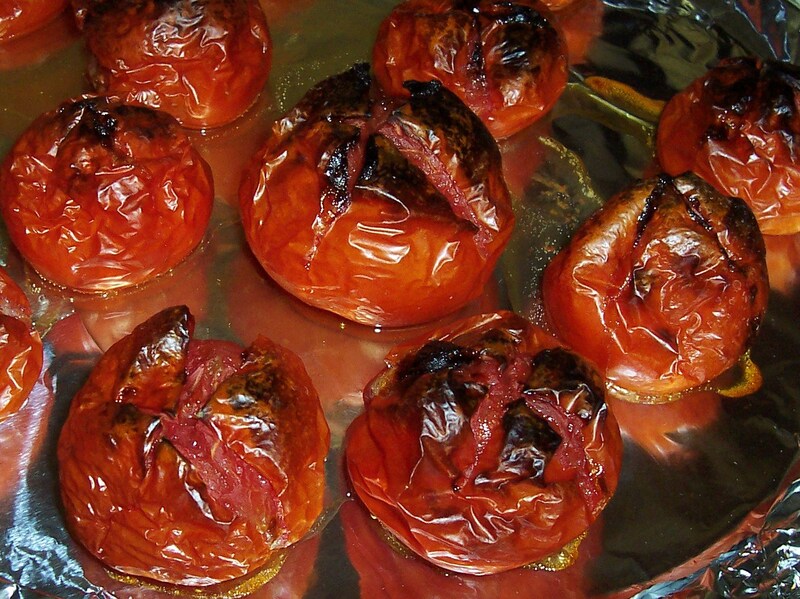 Mix all ingredients together and bake in the oven at 350° for 35-40 minutes. Recipe shown here with Broccoli and Panko Breadcrumbs. And here, as it’s supposed to be made with Spinach. Yum. Thanks for the recipe Aunt B.
FYI: These are the Panko Breadcrumbs I’ve been using in recipes. They continue to stay fresh and crispy each time I open the container. El Pollo Loco You’re Acting Like a Crazy Chicken. I have been one of your biggest cheerleaders for years, but some of your recent decisions have been disappointing. It started with the cutback of Tortillas. Having received 3 Tortillas with a Chicken Combo Meal since EPL’s opening in California, the downgrade to 2 Tortillas was quite obvious and lame. At first I thought it was a mistake, but then learned what’s up after a few visits. Not good. Then one day, NO more Chipotle Dressing for the Salads. Why? It was tasty. I was eating Salads at EPL all the time. Dressing can mean everything to a Salad. That crazy decision was hard to get over. And now NO more Chipotle Salsa — Another bad move. It was your best Salsa. I tried its new replacement Salsa (top left in above picture) and it’s okay. It has a good spice, but it’s a little too thin. The Chipotle Salsa went better with the Chicken and Tortillas. 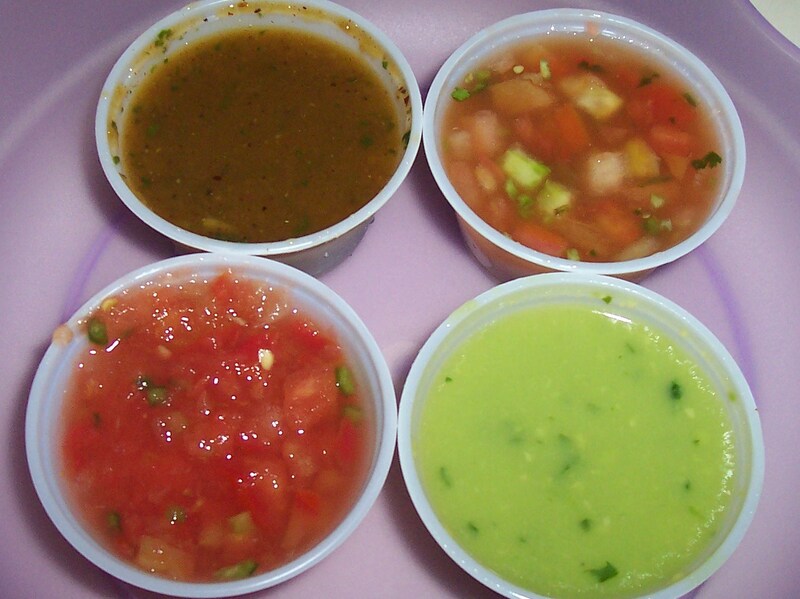 The thinner Salsa tends to make the Tortillas soggy. Bring back the Chipotle Salsa! El Pollo Loco you have been my favorite fast food joint for many years, but you’re acting crazy. You’re changing things that worked well for many. Can you explain your corporate position here, or better yet, change these things back? I’ll like you more. BTW, your Crunchy Taco is pretty good — I hope its time isn’t limited, but I somehow suspect it will be. But PLEASE don’t take away the Chicken. It’s excellent. I keep trying to recreate its flavor, but haven’t so far. All the copycat recipes I’ve tried miss the mark. Pictured respectively below are the Crunchy Taco, the Value Menu Nachos, and a Small Garden Salad with the Creamy Cilantro Dressing, the runner up to the Chipotle Dressing. What’s Nostalgic and Good at KFC? Apple Turnovers! 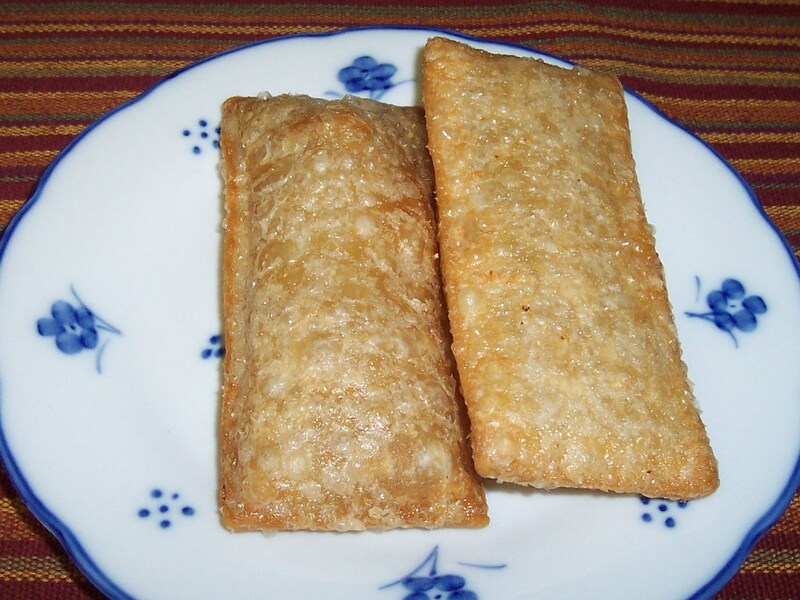 From the Diary of an equal opportunity eater: These Apple Turnovers are perfectly crisp on the outside and good on the inside. They remind me of how McDonald’s Apple Pies used to be when I was a kid. They changed them somewhere along the way and they’re not as good, if still available. I haven’t been to a McDonald’s in years, so please correct me if they’ve changed them again. In the mean time, KFC does the fast food Apple Turnover right. Currently you get two for $0.99 — It’s worth it. Update (11/27/09): They’re now sold for $1.59 for two, which is still a good price. Meeting CPK in the Freezer Section. It’s just okay. Since I LOVE California Pizza Kitchen’s Salads and Pizzas in their Restaurants, and this was on sale, I gave it a try. 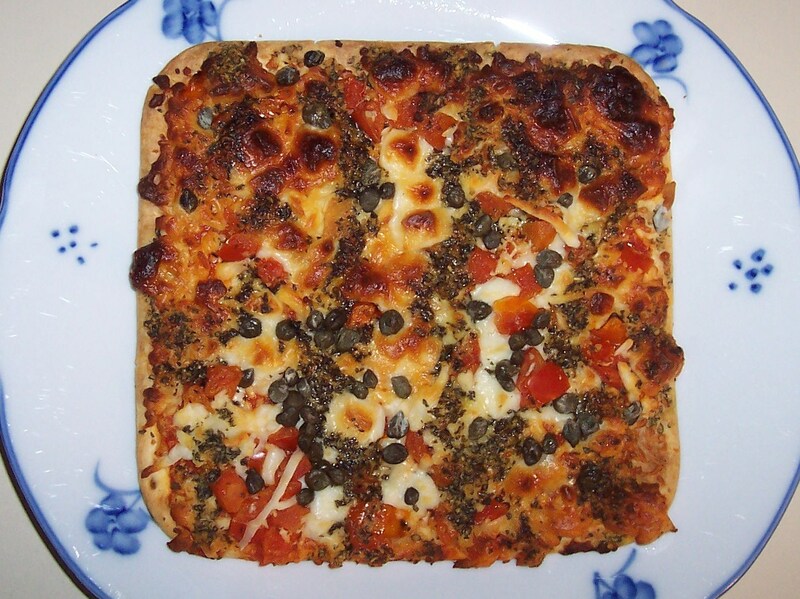 I added Capers before baking, because I often feel the need to add something to jazz up frozen Pizzas. The package picture doesn’t capture it well, but the Pizza has a fair amount of Pesto Sauce on it — As some Margherita Pizza’s do. Since I’ve been writing about the OC Fair, I have to show the animals. We won’t talk about this blog and its relation to some of them. Let’s just admire the animals for their uniqueness and creation. 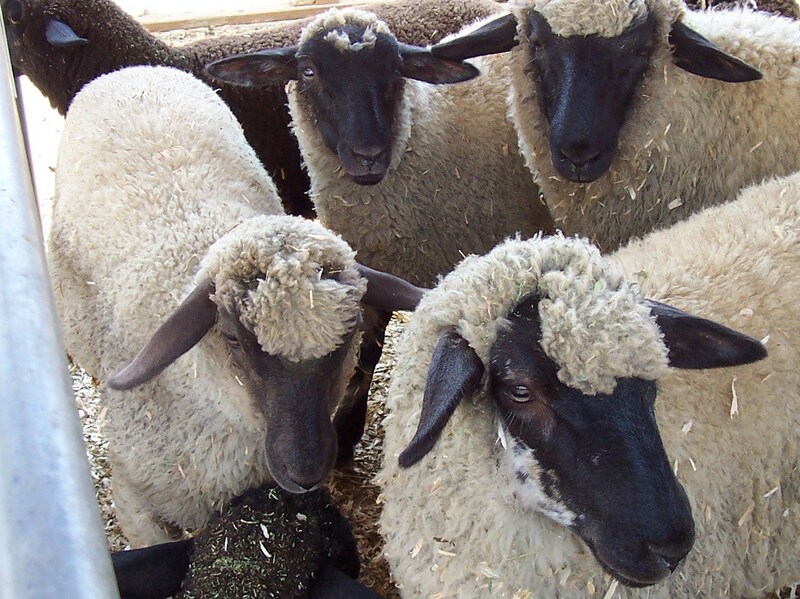 Centennial Farm has animals year round. After the Fair moves to the next town, you can still see some of them. The Orange County Wine Society at the Fair. 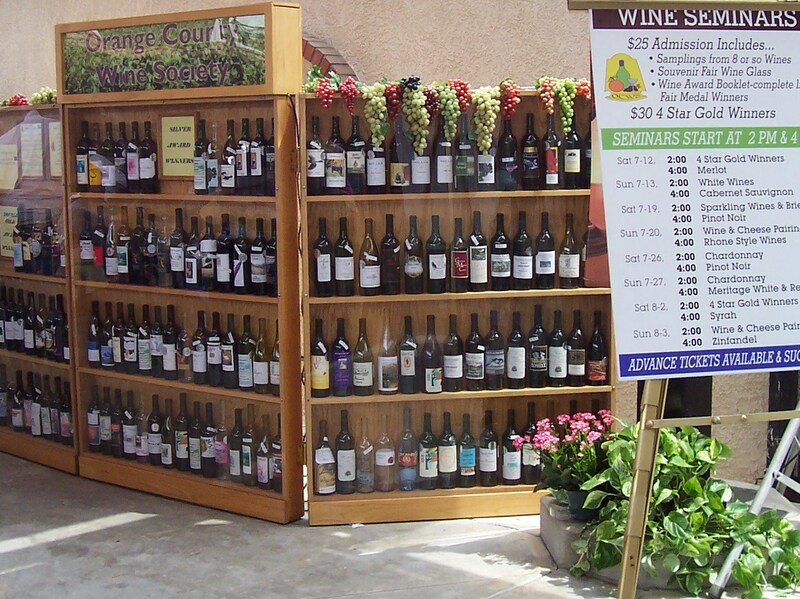 The Orange County Wine Society (OCWS) started with a group of independent Wine makers, but has grown and evolved to include those who simply love to drink it. 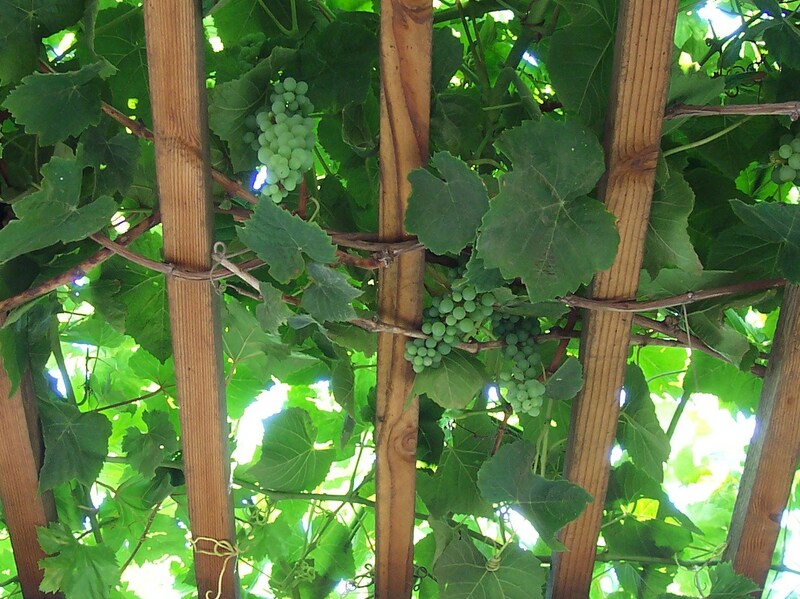 The OCWS functions to enhance the knowledge of Wine-making (viticulture or viniculture) and the appreciation of Wine. They’re a fun group who voluntarily pour Award Winning Wines during the OC Fair. This year $7.00 will get you a tasting of 3 Wines, plus the OCWS’s 2008 Wine Awards Book. And $3.00 will pour you a tasting of 2 Wines. TIP: You can get Cheese, Grapes and Bread from the Italian Restaurant outside the Wine Courtyard, all are shown below. More Fare at the Orange County Fair. More Than Fair Fare at the OC Fair. Some food is great and some just novel experiments. This day was a combination of both. 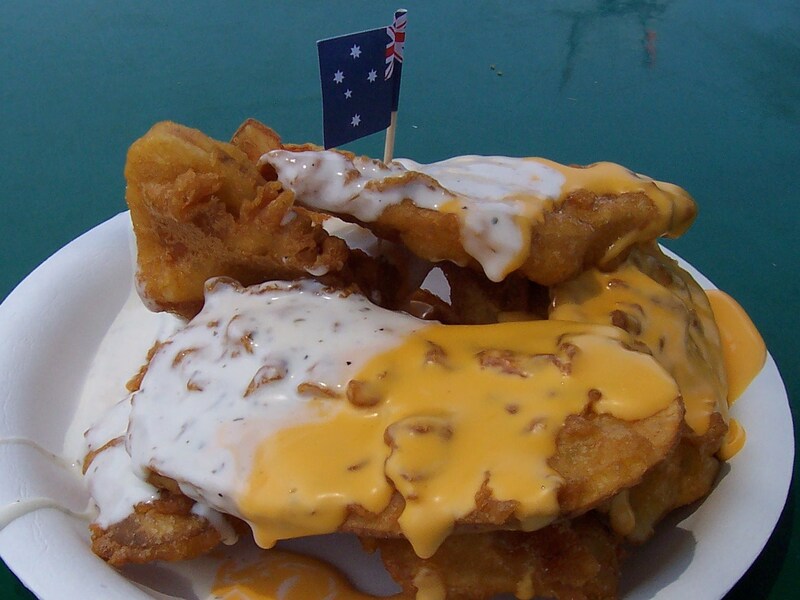 We started with Australian Battered Potatoes with Cheese Sauce and Ranch Dressing. I had read that they’re loved by many, so had to give them a try — And we liked them too. The batter was cooked perfectly, but they can get heavy after a couple. I’d probably share them with a few people again. And on a different note, there was the Fried White Castle Burger, which I won’t be getting again. My friend liked it, but it tasted way too greasy for me. Granted we had already eaten the above, but overall I don’t see its value — But it was fun to try. The following pictures respectively relate to the three above. Duncan Hines Orange Supreme Cake Mix Review. Since I love everything Orange Flavored, I had to try it. Here’s the naked Bundt Cake before a quick messy coat of Whipped Cream. It was super moist, but I must admit that I added a 1/2 box of vanilla pudding mix to the mix. I had an opened box and wanted to use it. I’m not sure if it made a big difference or not, but the Cake was good. 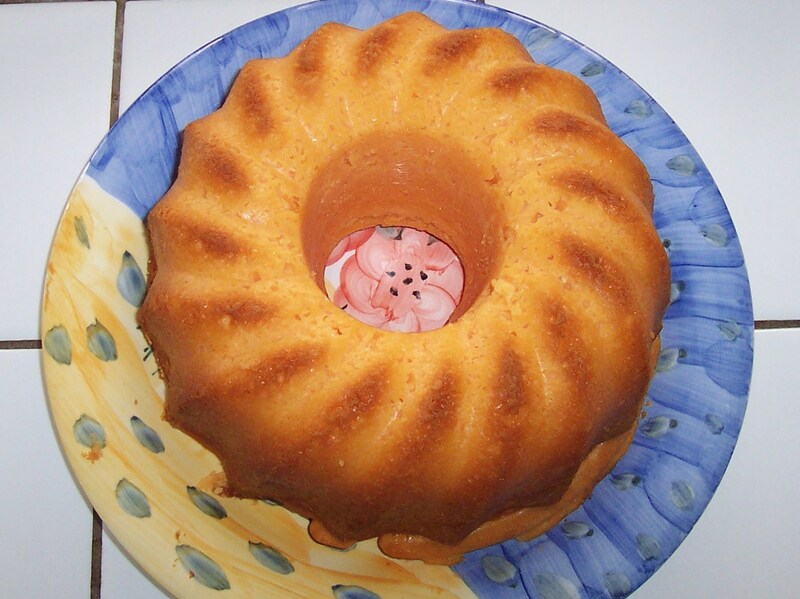 BTW, I previously tried the Pineapple Supreme Cake Mix and found it to be too sweet. The Pineapple flavor was a bit imitation tasting. I hope they rework that recipe. 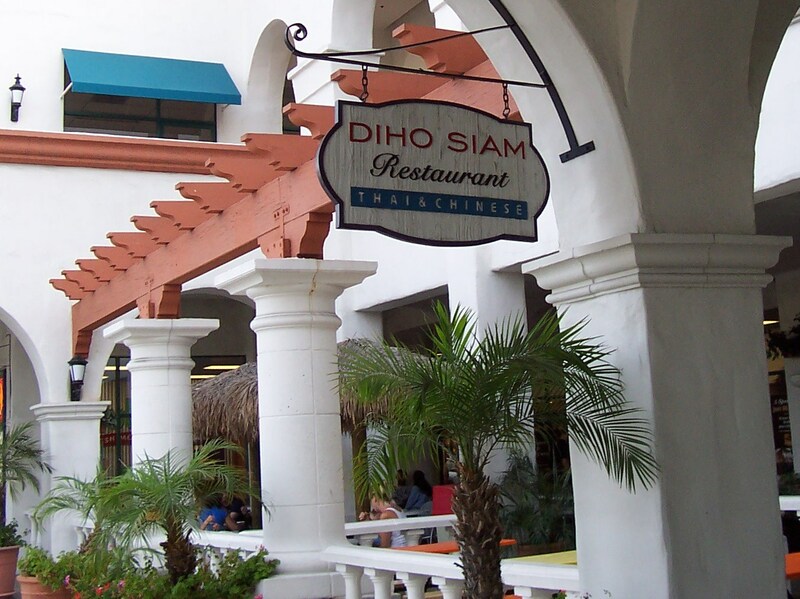 Diho Siam, I Am Thai or Chinese. I’m happy it’s within walking distance, since it’s pretty good. They serve a Thai and Chinese Menu, which is different. I usually get the Thai, but will eventually get around to the Chinese. This visit it was Chicken Satay, Thai Fried Rice with Pork, and Hot & Sour Coconut Soup with Shrimp (Tom Kha, here). All were right on. The restaurant is nicely decorated, but this time the food was TO GO. They have an outdoor patio too, and that’s always great. Another Food Related Competition at the Fair. 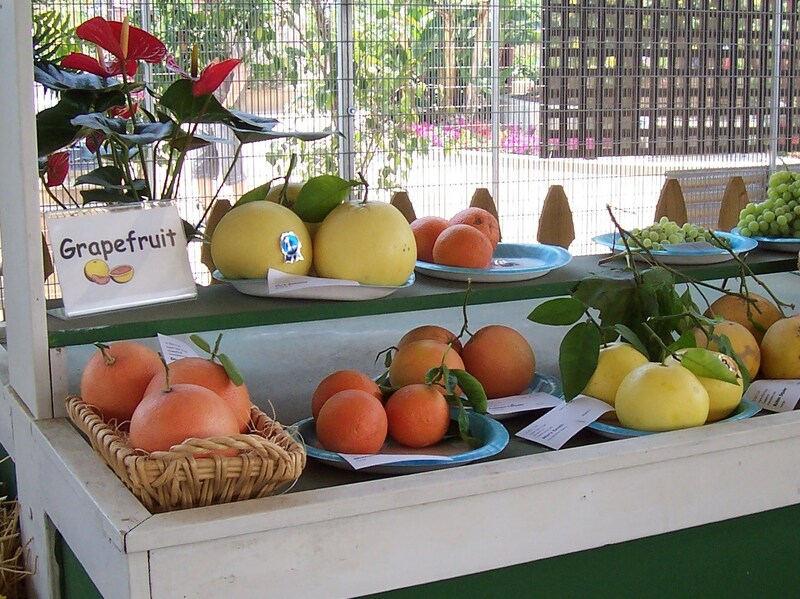 It’s the Farm and Garden Competition at the Orange County Fair. The biggest and best of Fruits and Vegetables, miraculous food from the earth. Thank you God. Grapefruit, Grapes, Carrots, Chili Peppers, Lemons and Zucchini. Plums, the largest Pumpkin and Avocados. The largest Zucchini, Onions and Nectarines. Pumpkins, Beans and Cucumbers, plus more that’s not pictured. Baking Contests at the Orange County Fair. This year the cooking / baking contests are rotating, due to lack of refrigeration and cost associated with same. It makes sense too, since the items are perishable and naturally breakdown. Last year some entries looked terrible towards the later days of the Fair. It was somewhat comical to look through the glass to see a shriveled up dessert and say to your friends — I can’t believe that won First Place – HA. 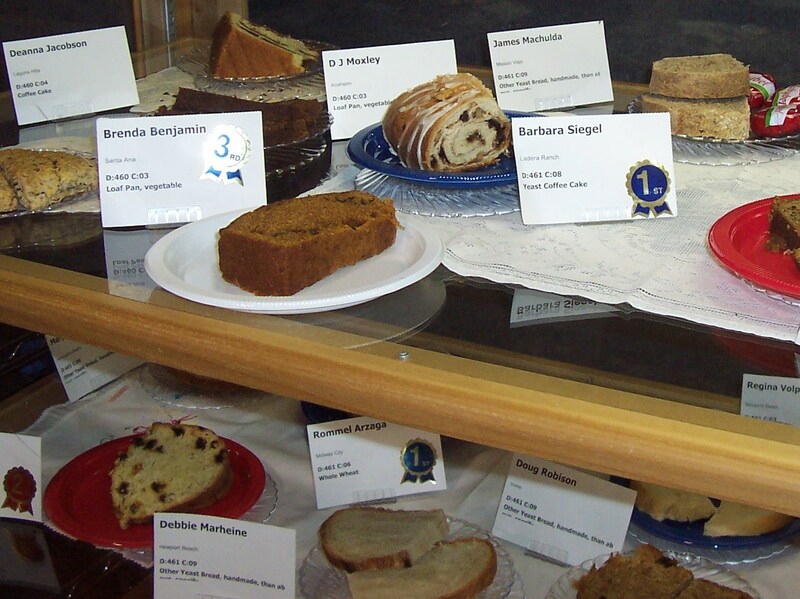 The Contest Categories on display this opening day appeared to be Fudge, Cakes, Scones, Biscuits and Breads. Next year I’m in. Registration begins in March 2009 — It’s the Home Arts Division. There’s also a Table Setting Competition. The table on the far left won First Place, and the other two are my favorites. Check the link below to learn about more food related contests and competitions happening at the Fair. What’s Growing at the Orange County Fair? Centennial Farm grows stuff there all year round — It varies with the seasons. Right now, during the Fair they’re growing Lettuce, Pumpkins, Brussels Sprouts, and more respectfully listed downward. Corn, Carrots, Turnips, Tomatillos and Grapefruit. Artichokes, Kohlrabi, Onion and Eggplant. Plus a lot more — It’s a dream backyard. The Orange County Fair Opened Today. 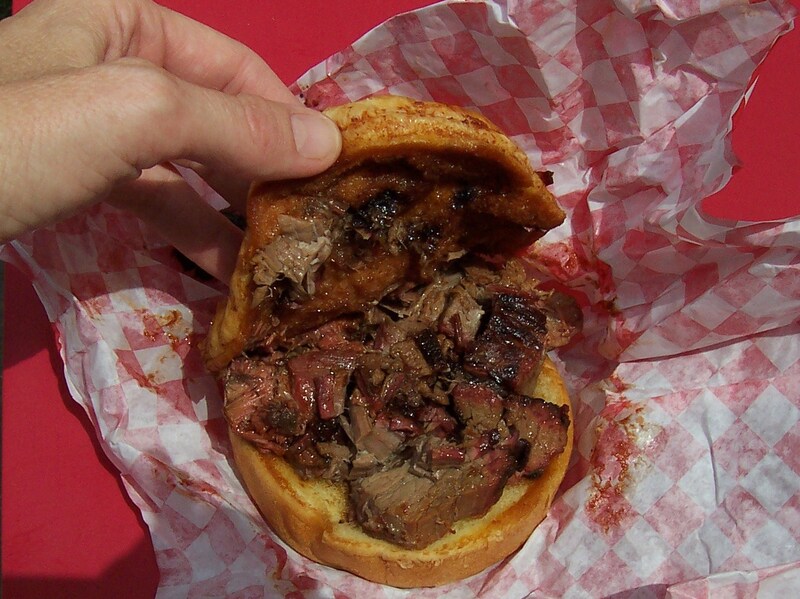 It’s definitely a FOOD FEST and I started with my favorite Brisket Sandwich at Texas BBQ. It’s the best. I make sure to get (at least) one every year. Here’s pics of the stand. It has a cow on top. 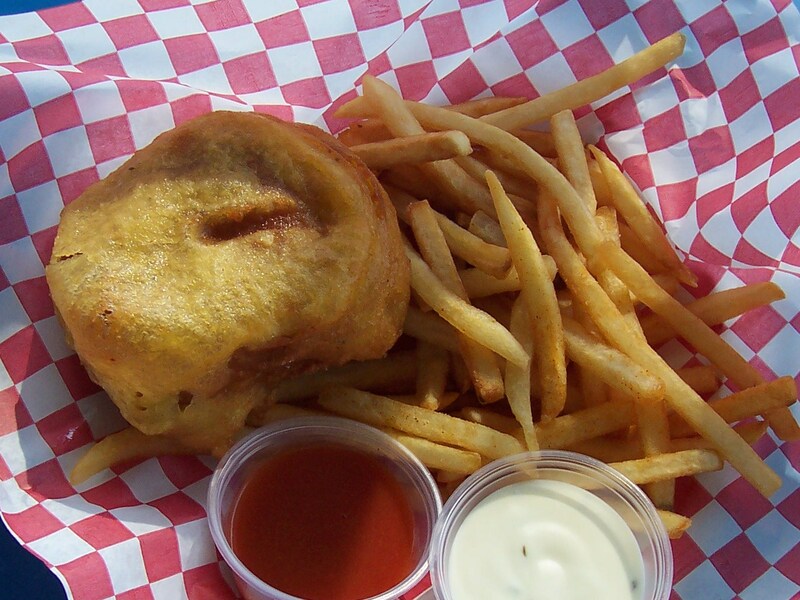 The food options appear never ending at the Orange County Fair. There truly is something interesting around every corner. This is just a small taste of 2008’s opening day, and the first of several reports regarding food at this year’s Fair. 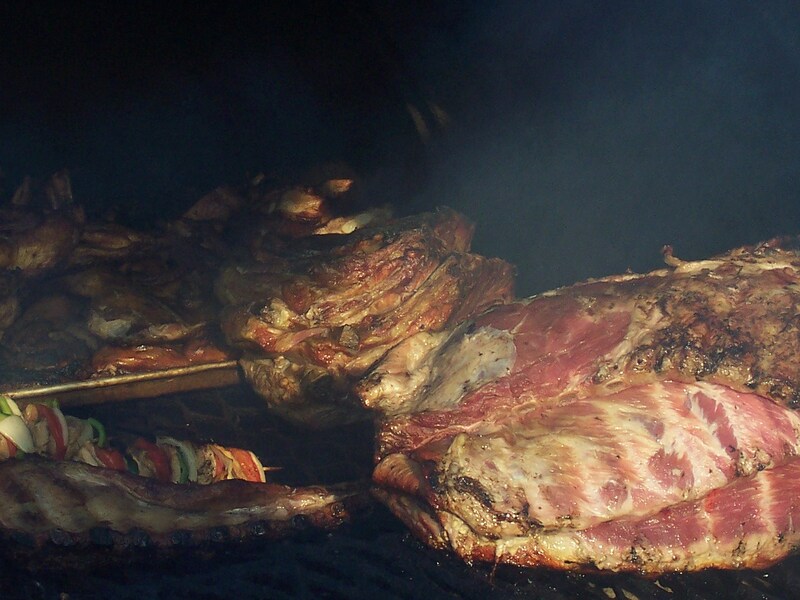 Enjoy the Rotisserie Chicken, Kabobs, Roasted Corn, Smoked Ribs, Turkey Legs, Hamburgers and Sausage — And save room because there’s a lot more. Beef Bourguignon Today & Tomorrow For Lunch. 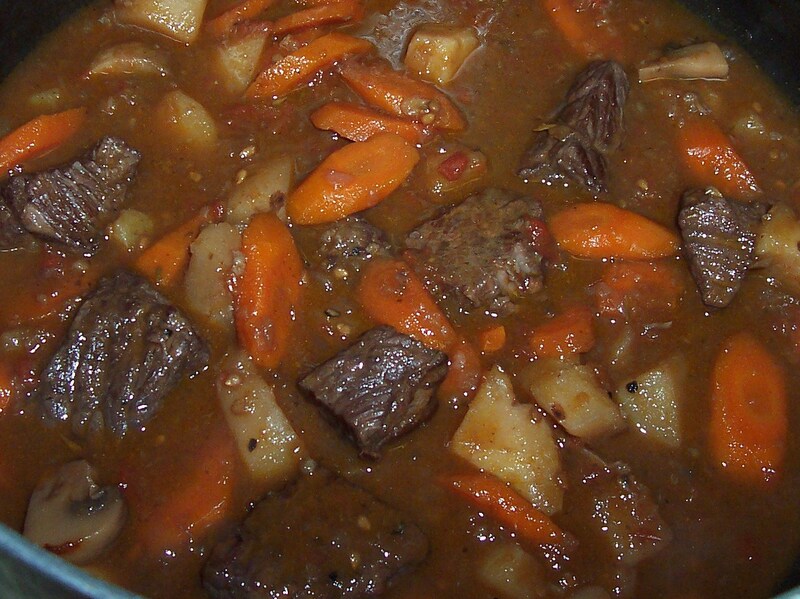 Here’s ingredient-by-ingredient instructions and pictures to an easy Beef Bourguignon. I’m happy to say that this one turned out great. The meat was perfectly tender and the broth was flavorful. To make the same, heat Olive Oil and Bacon Grease in a dutch oven, S & P some Beef cubes/chunks and quickly sear until all sides are brown, then remove and set aside. Peel and chop Onion, Carrots and Potatoes. Saute the Onion for about 5 minutes, then add the Carrots and Potatoes to brown. When sufficiently brown, add minced Garlic and cook another minute — Then add Beef Stock and a generous amount of Red Wine. And return the seared Beef to the pot. Add Mushrooms, Thyme, a Bay Leaf and peeled chopped Tomatoes. Cover and bake in the oven at 325° for 2 hours. Stir once every 30 minutes or so. After a couple hours all will be tender and tasty. And most of the time it’s even better the next day. See the notes and link below for more information. NOTE 1: Other vegetables can be substituted in this recipe. My preference in BB is Parsnips, Carrots and Mushrooms, but use what’s on hand when I really want something. NOTE 2: To make a larger portion, simply increase the ingredients proportionally. NOTE 3: Use Top Round, Bottom Round, Chuck, or similar stewing meat that’s on sale. It’ll be tender in this dish. To enjoy variety and test what tastes best, I prepared 9 Scallops 3 different ways. I seasoned four with S & P and seared them in a pan with a little oil, while the other 2/3 of the trio was broiling in the oven. Thankfully the seared Scallops couldn’t have turned out better. The cooking time was about 4 minutes. I prepared another three Scallops with a mixture of Mayonnaise, Sriracha Hot Chili Sauce, Lemon Juice and S & P — I topped them with the Sauce and sprinkled with Panko Breadcrumbs, then broiled them in the oven with the ones below. The cooking time was about 5 minutes. I coated the remaining two Scallops with Ponzu Sauce and Lemon Zest. 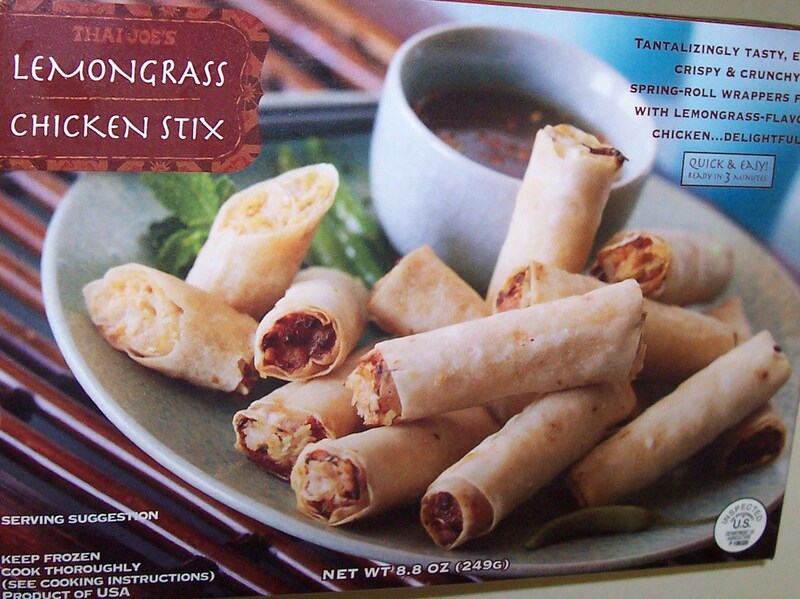 They tasted okay, but looked extremely boring. I won’t be repeating this 1/3 of the trio, but it was still fun to have the assortment and none were terrible. Overall, the seared Scallops were the best. The Sriracha Scallops were good too, but mostly because they tasted similar to a Scallop Handroll at a Sushi Bar. 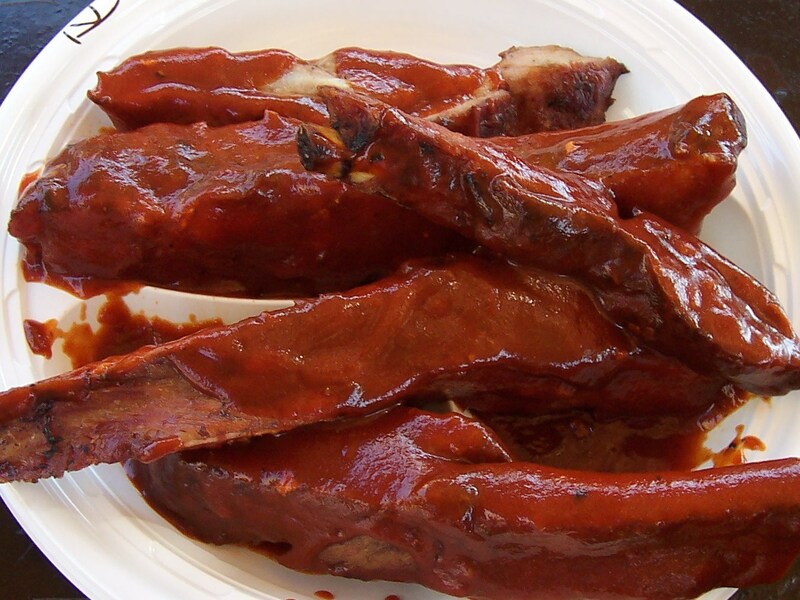 Next time I might just sear them and serve with a Sriracha Dipping Sauce on the side.